(Bloomberg) -- Talks to avert a new government shutdown over border security funding broke down late on Saturday, according to two people familiar with the talks. Republicans and Democrats are not communicating for now, imperiling the prospects for a deal as time runs short. Negotiations could still get back on track, but the prospect of getting a deal by Friday's deadline seem to have derailed just as lawmakers thought they were on track to reach a compromise. The sticking point is over the number and purpose of immigration detention beds, both people said, an issue that would typically be regarded as a side-note to the broader talks on the amount of funding for border security. President Donald Trump said on Twitter that Democrats were trying to create a distraction after "a very bad week." Without a funding deal, nine federal departments and related agencies would shut down again, just weeks after a 35-day closure. Negotiators had hoped to unveil a deal Monday to set up votes in the House and Senate before the deadline. "I'll say 50/50 we'll get a deal," Senate Appropriations Chairman Richard Shelby said on "Fox News Sunday." "We've got some problems with the Democrats" over funding for U.S. Immigration and Customs Enforcement operations. "As long as the goalposts continue moving, there's really no way we can lock in on an agreement,'' said Republican Representative Tom Graves of Georgia, who serves on the conference committee, said on ABC's "This Week." Senator Jon Tester, Democrat of Montana, said on Fox News that he was "not positive we'll get to a deal." Earlier, Mick Mulvaney, the acting White House chief of staff, said Sunday that a shutdown isn't the most likely option but that he "absolutely cannot" rule it out. "He's going to do whatever he legally can to secure the border," Mulvaney said of President Donald Trump on NBC's "Meet the Press," one of two scheduled appearances on Sunday talk shows. "You cannot take a shutdown off the table, and you cannot take $5.7 (billion) off the table," he said, referring to the level of funds Trump has been demanding for a wall on the U.S.-Mexican border. Trump has also threatened to declare a national emergency to get funding for a border wall. Mulvaney spoke as Congressional negotiators continue talks on a security plan that includes some sort of barrier, whether wall, fence or other, on the border, hoping to complete a deal to avert another government shutdown. It wasn't fair to say that Trump would sign whatever Congress comes up with, Mulvaney said, terming the level of proposed border wall funding "all over the map." As of Saturday it seemed that negotiators were homing in on a proposal with border barrier funding of between $1.3 billion and $2 billion, said a person familiar with the talks. Trump on Saturday suggested that if Democrats didn't give him all the wall money he's demanded, he may use executive action to build it. Democrats have warned such action would face court challenges, and some Republicans have suggested it's an option best avoided. Congressional negotiators traded offers throughout the day on Saturday until a breakdown last night, said the people familiar. 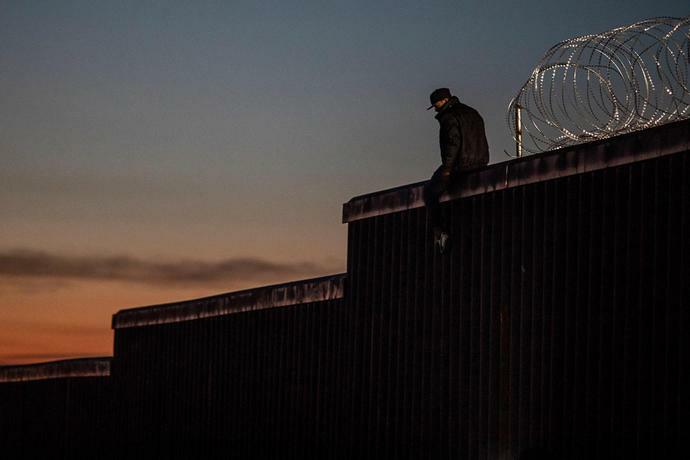 While the two sides are now said to be close to a dollar amount for border barriers, Democrats are making a higher level of funding for barriers contingent on the new cap for detention beds -- something Republicans are resisting. A senior Republican aide said Shelby won't accept any interior cap, and Democrats told Republicans they won't proceed without one. The aide said that lawmakers now need to talk directly to resolve the impasse because staff cannot move forward with offers, and that calls are expected today. The Democrats want to use the cap to force ICE to detain criminals rather than ordinary undocumented immigrants with no criminal history, a Democratic source familiar with the discussions said. The cap level matches an informal cap under the Obama administration. Republicans have said violent criminals caught inside the U.S. shouldn't count toward the cap and that ICE should have discretion about whom to detain. Trump re-entered the fray on Sunday, saying he doesn't think Democrats on the committee are being allowed by their leaders to make a deal with border wall money and "now, out of the blue, want a cap on convicted violent felons to be held in detention!" "I actually believe they want a Shutdown," Trump said in a separate tweet, suggesting it was a bad week for Democrats with the controversy in Virginia and good economic news for the U.S. economy. "They want a new subject!" Reducing bed space for violent offenders is an incentive for illegal immigration, Senator Lindsey Graham said on Fox News's "Sunday Morning Futures." The South Carolina Republican, a confidant of the president, said he would advise Trump "to take as much money as he can get [from Congress] and find the rest on his own." Representative Mark Meadows of North Carolina, another Republican who's close to Trump, echoed the president on Sunday on CBS: "this President is going to build a wall one way or another," he said. "I do expect the President to take some kind of executive action -- a national emergency is certainly part of that," Meadows said. "There are a few other things in his toolbox that he could use. But I do expect him to do that if we don't reach a compromise." --With assistance from Mark Niquette, Hailey Waller and Laura Litvan.